303 products makes a vinyl cleaner that I like a lot. Has taken out some real stubborn stains and doesn't seem to have any adverse effect on any of the upholstery. Love their protectorant as well. +1 for the speakersox. I have these on mine. Become a member and get a discount at speakersox. For the mildew, any descent upholstery cleaner & a soft brush. Scrub it good. Then let it dry in the sunshine. 2 days & it'll be gone. On the speaker covers, since I picked up a pair of Exiles, I use their factory covers & the whole can comes down & gets locked up. Purple power By PHAB is a really good cleaner mated with magic eraser. Works Best. 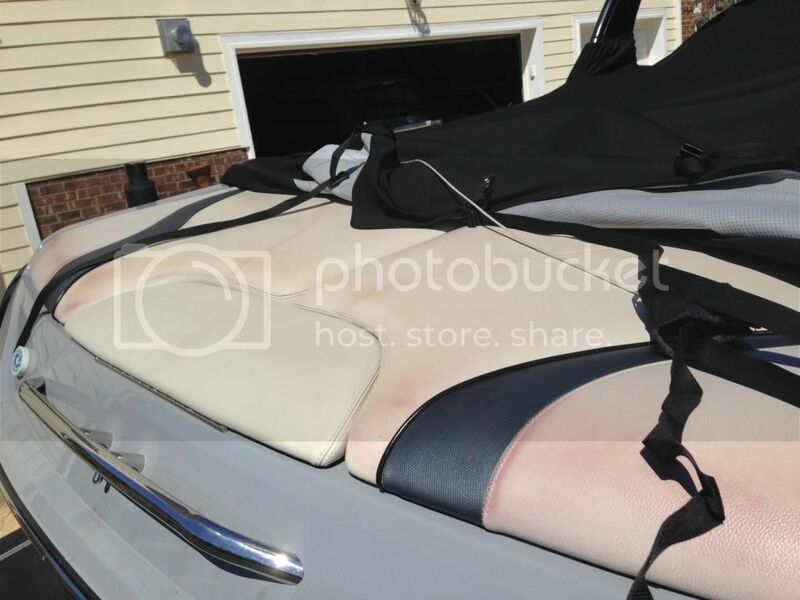 You still got mildew cause it was somehow damp in the boat...next time put out some Dry-Z-Air or even better than that, put a small heater in the boat and open all the cushions up allowing air flow. This will keep the boat warm and dry. It doesn't have to be hot, just 40-50 degrees and you'll be fine then. Recently went on a trip with the boat covered driving more than 14 hours interstate & endured 100+ deg F during the day. When we arrived at the destination uncovered the boat & pretty much every part of the upholstery which came in contact with the cover & even a few inches away from the cover turned almost purple from mould from within the cushion. Left the cover off for a few hours in the sun, & the discolouration bleached away. I store the boat in the garage, out of the sun & only cover it once the carpet dries out to keep the dust off. Doubt any cleaner will remove the mould. I have heard of the dry-z-air type product being used when boats are sealed when shipped from the US to AU to prevent this from happening or reduce the risk. Trying to get the crew (kids) to drain most of the water B4 jumping back in the boat is a bit of a challenge. What you're describing isn't mould it's the heat from the black cover causing the glue in the upholstery to have a reaction turning the vinyl a weird color. I haven't tried it yet, but I heard saddle soap works. 3M Mildew Remover. Works wonders. I've had general success (no mold) cleaning vinyl with Amazing Rolloff followed by 303. I still don't get this. I have a black cover & never have the problem. My buddy has a 2011 & has gone thru 3 covers. First one was black, sunbrella, no problems with the upholstery, but the logo was silkscreened in an off position. Second cover was some weird material like Sharkskin or something. His upholstery discolored. He got his 3rd cover over the winter, logo is right, made of Sunbrella. Time will tell if the problem with the upholstery shows up or not. Although I never had problems with it, apparently the reason you can't get a black cover anymore is as stated above. I believe they are all a much lighter grey for 2014. I wouldn't use a magic eraser on the upholstery. They are full of bleach and will take the colour right out of the vinyl. Also, you must must getting humidity in the boat, next time get a large jar, like a jumbo pickle jar and fill it will plain white rice. Poke holes in the top, maybe 20 and set it in the boat. It will soak the moisture out of the air, may have to change it monthly depending on humidity. Learned this trick as this is what is done to get water out of cell phones. It didn't happen to me on my '07 Sunscape that was all black with a black cover either. But after those years it started to happen. It happened on my brothers 03 too. Be careful with Magic Erasers. They are basically sand paper. I've seen the stitching & the finish on the vinyl get pretty chewed up by them. I've heard the same but that it does more damage to the stitching. I am starting to see seems pull apart on my boat and my guess is the previous owner used something with bleach. This! I would avoid if at all possible. There are other solutions to get tough stains out like some of the cleaners mentioned above. 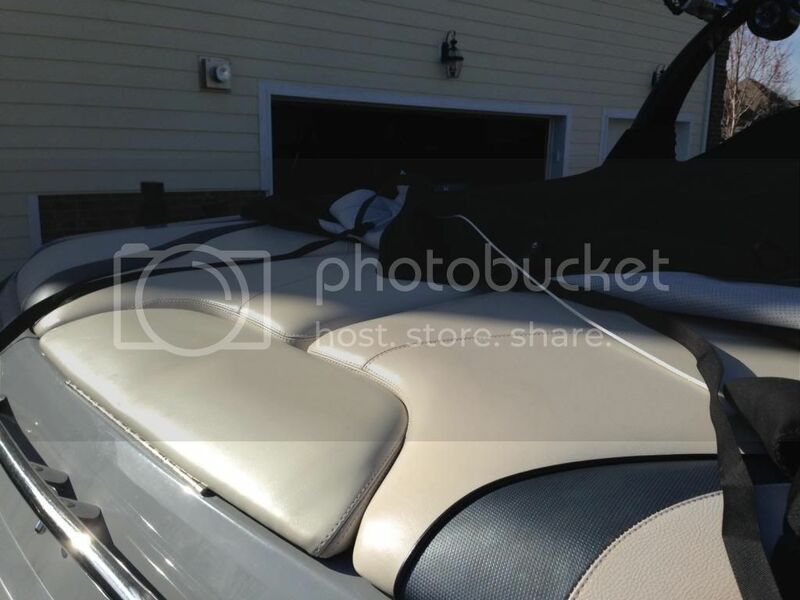 thanks for the input guys, funny thing is my cover is light gray and boat was kept inside all winter in a heated warehouse, thermostat set to 62 so never got below that, im dumbfounded how I have mildew spots on my rear engine cover lid, it is crazy to get it that quick on a 2013 boat. I have been hesitant to try many things because of the bleach or similar products in them. my interior is all grays and blacks and don't want to get white spots on it either. I ordered some starbrite stuff last night to try and im hoping that will get it, supposed to be fine for colored vinyl. ill let u guys know if it works, and for jdubb, I am in Fayetteville and mostly trailer to Jordan. The images from Ndawg12 above are exactly the scenario I experienced. Could be from the heat>adhesive, or could be some bacteria type mold reaction with the heat in the dark under cover in the sun. I know how heavy my removable cushions /seats are after a day of kids jumping in wet are. Always remove them & stand them on end for at least a week to help drain, but i suspect they will still be damp inside. Even thought last night, what would happen if the foam had a plastic membrane over the top just under the vinyl. Would this prevent most of the water from working through the stitching? Either way, with the wealth of experience & member professions on the crew, to my recollection, it remains a mystery. I would clean it, but don't do anything harsh and see if the sun will fade it. If you have indoor storage, don't cover the boat unless it's 100% dry or don't cover at all. Pull cover off and set it in direct sun. That's the only thing that will get it. I haven't seen under the vinyl on a Malibu, but my 1987 Glastron had plastic sheeting under it. It seems to help a lot. The seats on the Glastron never got soaked, just the surface was wet.